Rhinoplasty also referred to as a nose job, or surgery to reshape the nose, plastic surgery on the nose is one of the most common of all plastic surgery procedures. It can reduce or increase the size of your nose, remove a hump or bump from the bridge, change the shape of the tip or the bridge, narrow the span of the nostrils, slim down a bulbous nose or change the angle between your nose and your upper lip. Plastic surgery on the nose may also correct a birth defect or injury, straighten a broken or crooked nose or help relieve some breathing problems or difficulty. A septoplasty is performed to correct a deviated septum. For a rhinoplasty to look right for your face you need a careful clinical examination. The nose should fit the aesthetic proportions of your face and permit the delivery of air to the lungs without nasal airway obstruction. 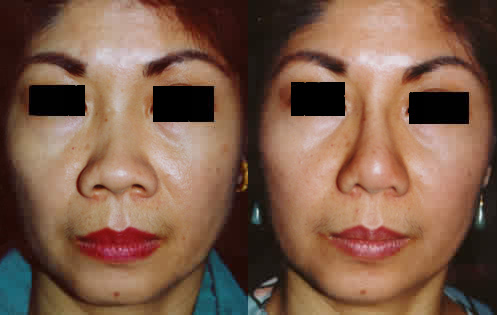 The asian nose has specific characteristics that make surgery quite different from the average rhinoplasty of a caucasian patient. Within the group of asian patients further subdivisions of types of noses exist so that the rhinoplasty has to be tailor made to meet each patient’s desires and needs. These subdivisions involve various degrees of severity and combinations of a rounded tip, a flat bridge etc. 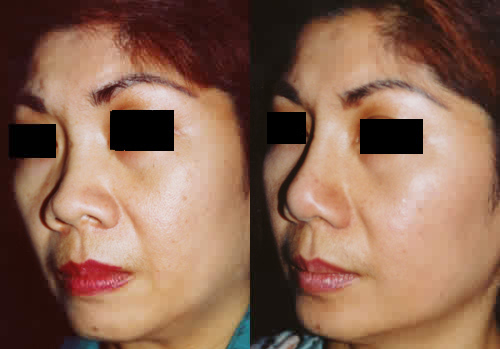 In this case of Asian rhinoplasty, plastic surgery on the nose, the bridge was raised and narrowed, the columella advanced and the nasal width at the nose-cheek junction narrowed. These are typically problem areas in the Asian nose. If desired the tip can be changed further to appear more Caucasian or less rounded if a less ethnic look is desired. This patient wished to keep her tip round. Medpor implants were used on the bridge. 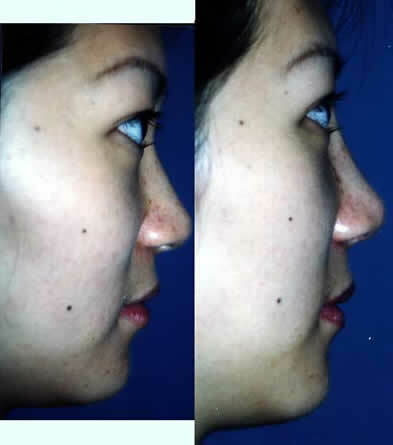 In this case of Asian rhinoplasty, plastic surgery on the nose, the bridge was raised and narrowed, the nasal width at the nose-cheek junction narrowed and the tip refined. This patient wanted a more Romanesque, less round tip. A medpor implant was placed on the bridge. These are typically problem areas in the Asian nose. In this case a more caucasian look is achieved without complete loss of ethnicity. These photos are taken 3 weeks apart. 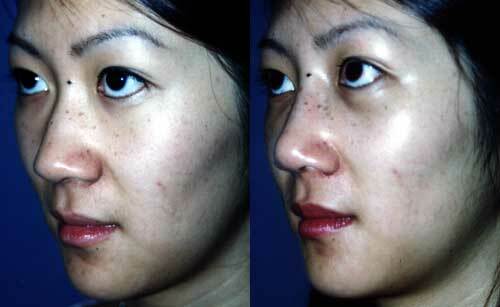 A non-surgical liquid rhinoplasty, which involves the injection of dermal fillers to the nose has become popular. Given the temporary nature of the injections and the limits of what can be done by just putting things in the nose in the absence of cartilage defects I do not see this as a replacement for surgery. Some surgical and non-surgical techniques to treat cellulite.